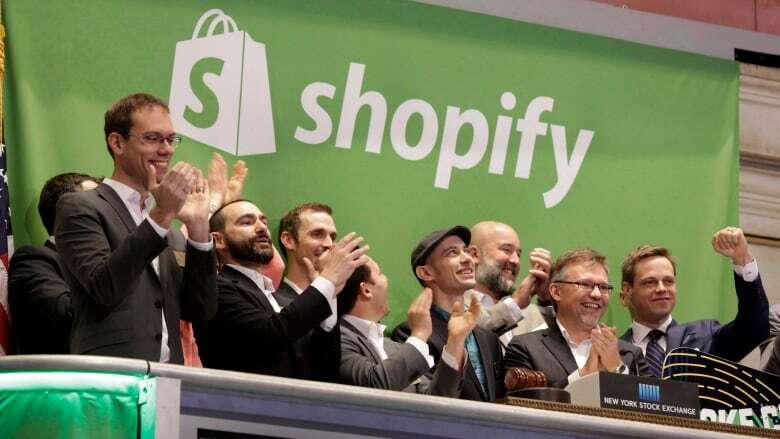 Shares in Shopify were down by as much as 11 per cent on Wednesday after a high-profile American short seller said most of the 500,000 businesses the company works with aren't legitimate. Citron Research's Andrew Left released a video Wednesday morning alleging that Ottawa-based Shopify's hype is unsustainable, and argues the stock should be worth half what it is. Shopify makes money by helping small and medium-sized businesses sell their products and services online, by handling all of the back end logistics of payments, inventory and web design via a cloud-based service. Since going public on the TSX in 2015, the stock has more than doubled this year, to become one of Canada's largest technology companies. But in his video and accompanying website, Left alleges that most of the company's customers aren't legitimate businesses, but rather simply people who have been sold dubious "business opportunities" built around reselling, which goes against Federal Trade Commission rules. "They are not selling them to business owners," Left said of the websites. "They are selling them to people as opportunities to get rich quick." Shopify is "a company that has mastered the good old get rich quick scheme," Left said, saying he can't account for as much as 90 per cent of the company's customer base. "This is not an $11-billion company," Left said. "This needs to get completely looked at by the FTC and completely looked at by Wall Street." He also accuses the company of paying bloggers and other online influencers to produce content favourable to Shopify without disclosing that relationship. Shopify did not reply to a request for comment by CBC News. Trading volume in the company's shares was about twice as much as normal on the stock market in Toronto. Left is what's known as a short seller, which means he makes money by betting against the performance of stocks that he thinks are overvalued. According to data compiled by Bloomberg, just over four million shares in Shopify are currently held by short sellers, about three per cent of the total. But that ratio has doubled since the middle of August. Left rose to prominence in 2015 when he went public with allegations that drug company Valeant was fudging its numbers. The Montreal based drug maker was the most valuable company in Canada at the time, but has since lost more than 90 per cent of its value. Other high profile Citron Research bets, however, have been much less successful, including attempts to trade against chip maker NVIDIA and car company Tesla.